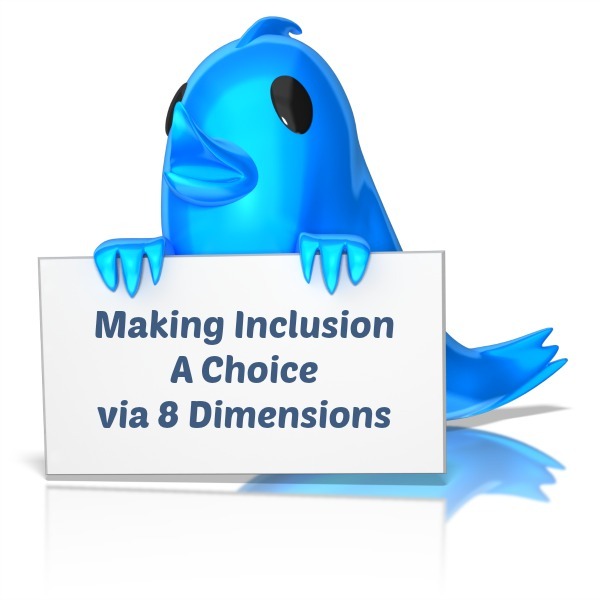 Join Us on Thursday, September 25, 2014 at 2PM ET, for our next Live #Diversity4CAN/#Diversity4US Twitter Chat – Making Inclusion a Choice: 8 Dimensions to Consider to Make Inclusion a Reality. In an effort to continue the ongoing digital conversation on Equity, Diversity, and Inclusion (EDI) on social media we're hosting our next Live Twitter Chat this Thursday at 2PM ET and you're invited to participate! The #DiversityCAN (focused on Canada) and #Diversity4US (focused on the United States) will be used, and you can check out the archive of our first chat to get a feel for how the next one will turn out: The Inaugural #Diversity4US #DiversityCAN Live Twitter Chat Archive. We hope to see you there so please check out our How-To Guide for Participating in a Twitter Chat so you can join us! Making Inclusion a choice, is always multi dimensional. After years of talking about diversity and inclusion, you come to realize it is a very important component in the work place. I enjoyed all the articles on this page and best of luck to Kindra Cotton. Thanks.